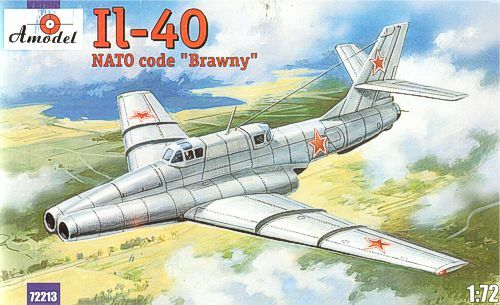 Ilyushin Il-40 "Brawny" modified prototype with extended intakes. Two-seat Soviet jet-engined armored ground-attack aircraft. The first prototype flew in 1953 and was very successful except when it fired its guns, as their combustion gasses would disturb the airflow into the engines and cause them to flameout or hiccup. Remedying this problem took over a year and involved the radical change of moving the engine air intakes all the way to the very front of the aircraft and repositioning the guns from the tip of the nose to the bottom of the fuselage, just behind the nose wheel. For all that the aircraft now resembled a double-barreled shotgun from the front its problems had been cured and it was ordered into production in 1955. But only five production aircraft had been completed before the entire program was canceled in early 1956 when the VVS discarded its close air support doctrine in favor of tactical nuclear weapons on the nuclear battlefield.